Abdul Kalam bacho se lekar old man subke prena sroth ha .Bahut se log unko apna ideal manthe ha .Abdul Kalam ji k jeewani ko aapne bahut ache se varnit Kiya ha . Very Nice lekh . 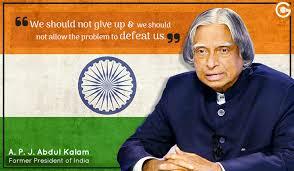 Kalam Sir has always been a inspiration to Youngster for his dedication towards his hardwork. Above passage makes us understand a more depth knowledge about Kalam ji. Will like to know more about him. Ankit ji, Thanks for sharing his views.